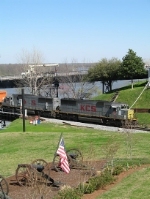 Description: NS 339 at Hull, Alabama, headed south to the KCS speedway at Meridian Miss. Date sometime in 2005. Description: Crossing the Mississippi at the Welcome Center. Description: GWWR 4097 trails as they lean into the curve. Description: KCS SD50 7012 ex-Conrail. Description: Extra 7012 East departs Greenvilles Hunt Yard with a Maintenance of Way train in tow.